HARPER Gerald (Gerry) died on 8th February 2019, peacefully in hospital. Beloved husband of Winnie, adored father of William and Annabel, and wonderful granda of Mitchell, Thomas and Matthew. Funeral Service will take place on Thursday 14th February at 1.00 pm in Park Avenue Free Methodist Church, Belfast, and afterwards to Roselawn Crematorium at 3.30 pm. 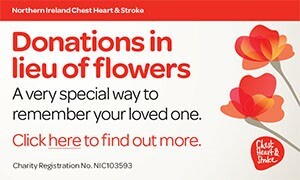 Donations in lieu of flowers, if desired, may be made payable direct to Macmillan Cancer Care, Unit 5A Stirling House, Castlereagh Business Park, 478 Castlereagh Road, Belfast BT5 6BQ. Deeply regretted by Ann, Bill, Geri and Gail. Deeply regretted by his brother Billy, sister-in-law Gloria, also their children and grandchildren. Much-loved brother-in-law of Margaret and the late Hugh and Robert Scott. Deeply regretted by Marnie, niece Lynsey, nephews Tim, Steve, Ben, Sam and their families. I am sorry to tell you that Gerald (Gerry) HARPER has passed away.